Sunday, March 22 – 9:00 a.m.
Click here to see the photos for the 2015 event by Dan Wyman. This year there were only 25 riders attempting the climb. Last years new records (women – 103…Heide Volpe and men – 113…Mario Correa) set in only eight hours were never in jeopardy. Even though only 17 riders made it to the top there was plenty of action. George Holstein (Last years second place rider at 80 climbs) and his buddy, Stephen Romio, traded blows all day. Stephen finally came out on top by only one climb at 54. Coming in third was Jesus Agrezar with 46 climbs. 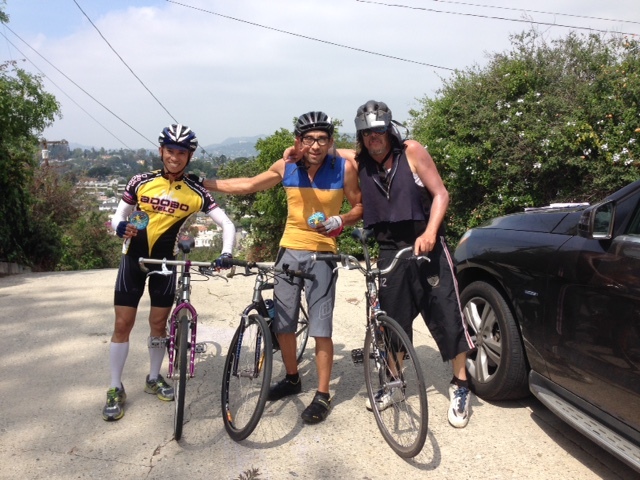 There were three ElliptiGos climbing the hill with Chris Zito heading the list with 60 climbs. 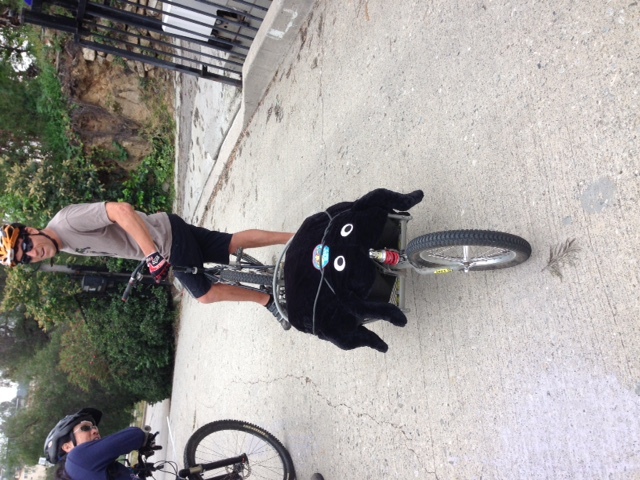 See attached photos…Hugh Warren climbed the hill with a spider in tow. I guess the hill wasn’t difficult enough. the second photo shows the three leaders on the day. From left to right: Jesus Agrezar (46 climbs), Stephen Romio (54 climbs), and George Holstein (53 climbs). Start Location: Allesandro and Fargo Streets. From the I5 Freeway, take the Glendale Freeway (SR 2) South; exit at Glendale Blvd and turn left; turn left to Allesandro Street; three blocks to the Fargo Street intersection. Street parking is challenging here so plan to arrive early if possible. This annual event dates back to the 1970s, but is almost as popular today as ever. It is dedicated to the truism that most cyclists have never seen a hill they didn’t want to climb. 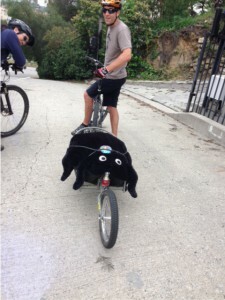 The question today is, “Can you do it?” And the second question is, “If you can, how many times can you do it?” The hill in question is Fargo Street, reputably the steepest hill in Los Angeles. It’s only a couple of blocks long, but at over a 30% grade, it’s quite a feat if you can climb it. Many will just want to see if they can make it up the hill at all. Amazingly, others vie to see how many times they can make it up the hill in one day. The record is now well over 100. Even if you don’t feel up to the challenge, many show up just to watch the others try. So, come out to cheer them on and maybe you will be inspired to give the hill a try yourself. Its a thrill either way.